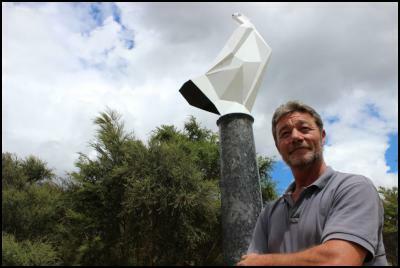 Four sculptures from the city’s recent sculpture symposium have been added to Rotorua Lakes Council’s (RLC) permanent public art collection for locals and visitors to enjoy. The Sulphur Lake Sculpture Symposium – with a theme of The Returning Soldier - was held over two weeks late last year at Rotorua Arts Village, with 17 local and national sculptors participating including a guest artist from Russia. The sculptures now form the evolving Sulphur Lake Sculpture Trail in Government Gardens as part of the council’s commemoration of the 100th anniversary of the Gallipoli landings during the First World War. Judges selected nationally recognised sculptor Anna Korver’s piece The White Mouse, depicting New Zealand war heroine Nancy Wake, as the winning artwork. It will now become a permanent part of the council’s public art collection. RLC community arts advisor, Marc Spijkerbosch, said community feedback on the Sulphur Lake Sculpture Trail had been phenomenal. Mr Spijkerbosch said the council was also given first option to purchase a second piece, and selected Rory McDougall’s TheGhost Soldier to complement the winning sculpture. Rotorua Trust has purchased a further two of the sculptures for the city, Forever Remembered and Tank Trap by prominent local artists Paul Bottomley and Jamie Pickernell, resulting in four permanent memorial sculptures at the key entranceways to the sculpture trail. “Council receives a twenty per cent commission on all sales during the two-year exhibition,” said Mr Spijkerbosch.